PCLinuxOS - the Big Daddy of Desktop Linux: What keeps some PCLinuxOS users from deleting Windows? What keeps some PCLinuxOS users from deleting Windows? I was browsing and responding to my threads (on X3100 graphic driver for GMA965 graphics adapter) posted on PCLinuxOS and Granular almost full time for some 15 days. There I came across a thread in the PCLinuxOS forum, “What's keeping you from deleting Windows?” by PiEp. Definitely, there is lack of some industry standard software that run on Linux. This a real hurdle in desktop deployment of Linux in home as well as in office. Pathetically, software makers have no problem in porting their software to Linux, but they don’t do it because porting to multiple types of distributions would cost them more than they can make profit. Hence, this problem is supposed to be there until some great free software comes in. 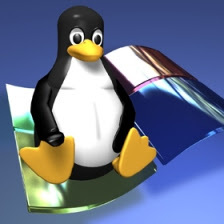 Here is the list of software for which many Linux users still run Windows on their Linux machines. Let me explain it. I have been using Linux for quite a long time and PCLinuxOs at least for last three years. But still sometimes I need Windows for some industry standard software like Adobe Premiere, FinalCut Pro, AutoCAD, PhotoShop, etc. No doubt, there are Kino, Gimp and other Linux wannabes, but they just are not as polished or as productive as their Windows counterparts. The next major reason for not deleting Windows from their PCLinuxOS Machines (Note: I call their machines as PCLinuxOS machines, because they do their regular chore mostly on PCLinuxOS, and rarely boot Windows for some specific works) is somewhat personal and somewhat professional. Someone has to make his/her PC dual boot with Windows and Linux, since the spouse and kids love those wonderful windows games. Whereas someone keeps Windows to do some official work at home, and Linux applications are not 100% compatible with the company’s Windows standards. A very few members told they have not deleted Windows because they have already purchased Windows Copies. And they don’t want their money go waste of non-use. While a few shaky beginners to PCLinuxOS have kept Windows as their second boot OS, as the last resort if something goes wrong with their Linux. More on this topic next time…..
the other thing is that you can break your desktop environment easily in linux whereas in windows the user can mess up with the default desktop environment. yeah, linux desktop often breaks as it is not as tightly integrated as windows. It never breaks like windows breaks. Ever.